Polio is an infectious disease, caused by a virus, that attacks the muscles, most commonly in the legs. 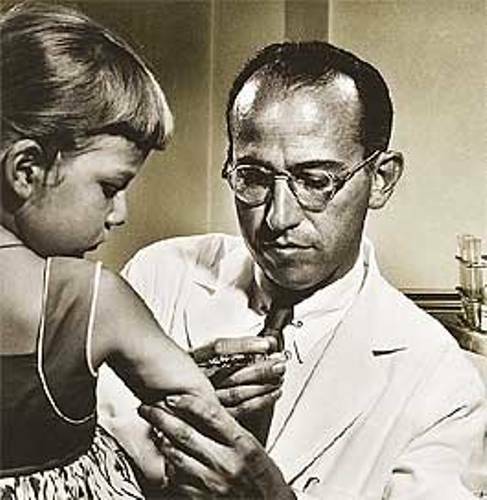 In 1952 Jonas Salk, working at the University of Pittsburgh, developed a vaccine. After tests it was announced to the world on April 12th 1955 by Dr Thomas Francis. Most diseases decrease as sanitation gets better, but Polio was an exception. Noted as far back as Egyptian times, many communities had become fairly immune to Polio. Polio does not generally attack babies and infants and so many children had already become exposed and immune to polio by the time they reached 5 years old. Developments in sewage treatment in the 19th and 20th century meant less infants met Polio at a young age. This led to a sudden increase in Polio at the beginning of the 20th century. By 1952 the US alone had 58000 cases, resulting in over 3000 deaths a year and over 21000 people with some sort of paralysis. A graduate of New York School of Medicine, Jonas Salk was granted a fellowship at the University of Michigan under the guidance of Thomas Francis. In 1947 he moved to a job at the University of Pittsburgh, and in 1948 took on government funding to investigate different forms of polio. Salk used this work to also investigate the possibility of a vaccine. He put together a team: Byron Bennett, L. James Lewis, Julius Youngner, as well as a secretary. 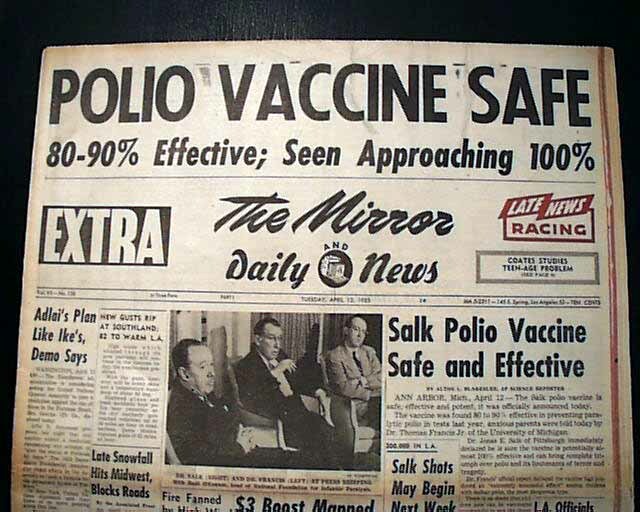 Salk’s team wasn’t the only team working on polio. Notable scientists on similar projects were Albert Sabin at the University of Cincinnati, and Hilary Koprowski and Herald Cox at New York’s Lederle Laboratories. All these scientists had success, but the nature of their vaccines affected their place in history. Koprowski was the first to develop a vaccine, using a live polio virus. In 1948 he gave the vaccine to himself, and did not appear to suffer any affects. He then tested it on 20 children to see whether they picked up the necessary antibodies; 17 did, and 3 were believed to already have them. Koprowski’s vaccine was picked up by some foreign countries, but the US did not give him permission to widely use a live virus. Koprowski would later use his vaccine on a quarter of a million children in the Congo, with no issues. 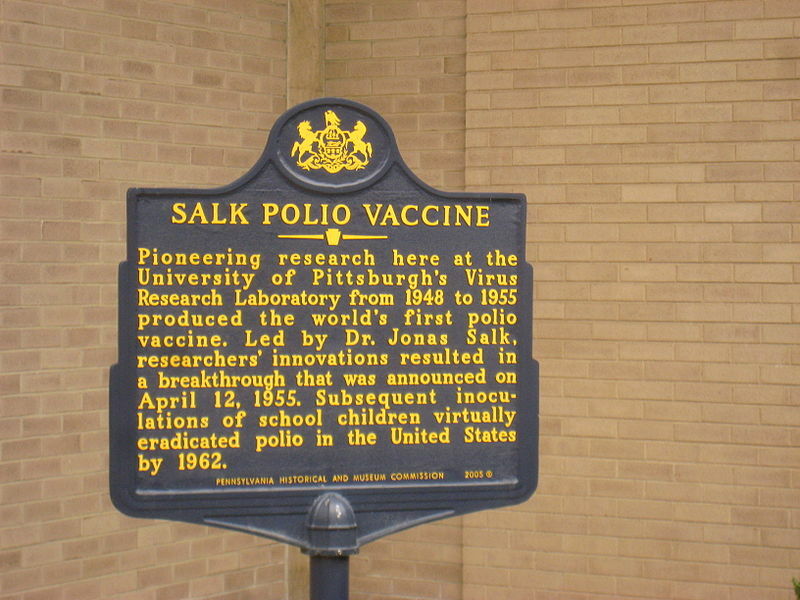 Salk and his team, on the other hand, were developing their vaccine using a dead virus. 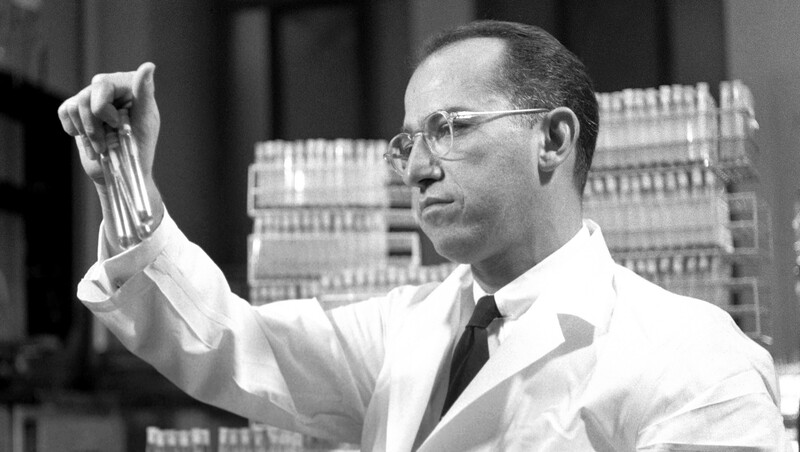 On April 12th Jonas Salk announced he had developed a vaccine for polio. This vaccine was created by giving infants an ‘inactivated’ (dead) polio injection, thus making them immune. Dr Thomas Francis, Salk’s former mentor, then began the largest medical experiment in history, testing 1.8million children across 44 states of the US. From 35 000 cases in the US in 1953, the number fell to 161 in 1961. In 1957 Albert Sabin began trials of an oral vaccine. The oral vaccine was licenced in 1962. The oral vaccine was often given on a sugar cube. Currently many developed countries give a series of polio vaccines to babies. It is not recommended to adults in developed countries because they have probably already encountered polio, but is given to adults in 3rd world or developing countries. The polio vaccine has a very high success rate. The issue now is getting the vaccine to the world. In 1993 China immunized 80 million children in two days. The following year only 5 cases of Polio were reported. The WHO began a widespread Polio vaccine programme after it was introduced. By 1988 there were 350 000 cases reported worldwide. By 2012 the number was 223. The Polio vaccination remains on the WHO’s most important vaccinations list. In 1990 the WHO believed 500 000 cases of paralysis had been stopped by the vaccine. Salk and Sabin are both widely known scientists today. While Koprowski publicly said he didn’t mind the lack of recognition his vaccine received, as it allowed him to continue research unmolested by the media (he also developed a rabies vaccine), it is believed he personally felt hurt. In 2007, 6 years before his death, he was finally given an award. The award was named after Sabin. The last surviving member of Salk’s team, Julius Youngner, died in 2017. Ronald Reagan announced May 6th 1985 to be ‘Jonas Salk Day’.